It was ten days ago that I ran that 21 miles, and last week I took most of the week off from running. Well actually in comparison to all my other weeks of training, I hardly ran at all. This is not necessarily a bad thing, but just not for the best reasons. I would have taken it easy last week no matter what, but there was another reason why I didn’t run at all. My little running buddy Ringo injured his back paw. I am not sure exactly what he did, but in the process of jumping off of my bed on Monday morning, his did something to his little toe. He seems fine, and still gets around okay, but you cannot touch that foot without him reacting to the pain. He doesn’t whimper or cry, because even at his age he is more a manly dog than most. He just tries to lightly nibble at your hand, but never bites. Also you can tell when he starts to favor it. He is actually one tough dog. Kind of reminds me of a tough ol’ broad I used to know – Monroe. Because I use my morning running to also work off Ringo and Lola’s energy, I had to change gears, so they could get some exercise, but long stretches of running was out of the question. I had been on the fence about taking him to my vet, but after that incident, I decided to get him in first thing that morning. Unfortunately when I got there, I discovered that my vet was out of the office. The vet tech said if I had any left, to give him 1/4 doses of Brewster’s anti-inflammatory pills to see if that helps with the discomfort. Brewster was taking these pills to help with the pain and swelling that was due to his osteosarcoma. He was on 100mg a day; Ringo only needs 25 mg. She also said to keep Ringo as quiet as possible. If you have ever had a 10 month old puppy, then you know that is nearly impossible. There were no puppy walks for him all weekend. I did get his sister Lola out for a good long 5 mile walk/jog on Sunday. It gave me some one on one time with her, to work on her leash manners, and allowed Ringo to relax in his crate and give his foot some rest. The one thing that I am going to have to work on with Lola, is her zig-zagging. I usually tie the leash around my waist, when jogging with Ringo and give him enough slack, where I don’t trip over him if he gets ahead of me. Ringo is good about being off to my right side, and hardly ever runs ahead; he keeps pace with me. With Lola the problem is, she weaves back and forth and likes to be in front. She doesn’t necessarily pull, but just likes to be in the lead. There is just so much out there for her to see, that she wants to see it ALL at once. So when she is put into the position of Ringo’s, she doe not handle it as well as him. I think I need to step back, and work on her walking with me. This week sadly I will be doing all of my running sans puppies. Ringo is still needing to rest that paw, and Lola is being spayed today. They will both be crated a lot. A LOT. I have never had to confine two dogs at the same time, ever. The barking is going to be like fingernails on a chalkboard. I wonder if the vet would be so kind to prescribe some sedatives… for the entire household? 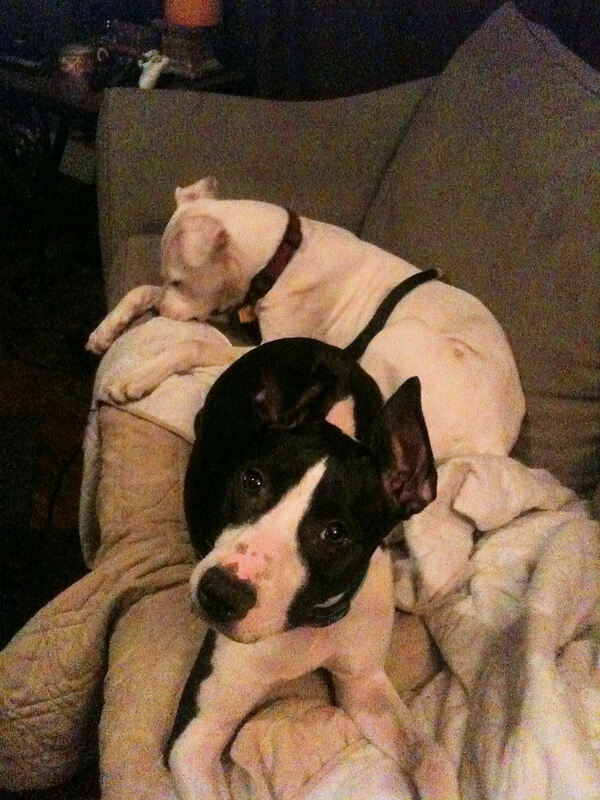 This entry was posted in Fur babies, Running Wellness by Raven. Bookmark the permalink.